Our mother is a good cook, when she wants to be. Back in the days when she was the primary cook in our household, her black peppercorn shortribs kept the memory of beef alive in our house. I don't know where our mother gets her dish ideas from, but this one is pure genius. It's another simple dish whose sum is greater than its parts. Our mother loves black pepper. In fact, we used to joke about living under her black peppercorn regime -- which occured about some ten years ago -- when everything we had was seasoned with pepper and NO SALT. There might have been some soy sauce, but on the whole, everything had no taste except the peppery taste. It was a trying time for us. In this dish though, the peppery is balanced with the salty and everything is just fine and dandy with the world. Another very easy recipe to do. All of our mother's recipes seem to involve dumping various ingredients into a pot -- most likely culprits are ginger, black pepper and soy sauce -- and simmering. Yet they do seem to taste different from each other. By the way, it is quite futile to ask our mother verbally how to make any of her dishes as she only says: "I put this, this and this. I don't know how much of each." So, the best way is to stand beside her and wordlessly observe. Quite funny, then, that these are rogue pictures that our mother took! I'm sitting at the computer uploading our photos and I see these hiding among them! I guess, quite rightly, that she thought her Black Peppercorn Shortribs is a blogworthy dish. First thing is to blanch the beef. It really is not necessary to "clean" the meat this way, and, if you prefer, you can brown first the beef for bolder and browner flavours. Lack of industry prevents us (mother included) from doing the latter. 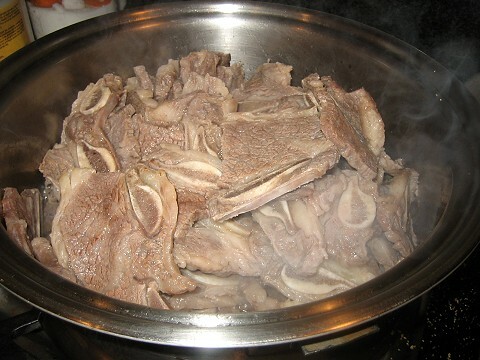 Besides, "cleaning" the meat is a more traditional Chinese method. Sauté a little bit of ginger until fragrant. Add the beef pieces in. 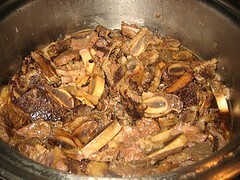 According to Mama, if you do not blanch ("clean") the meat beforehand, as sometimes her lack of industry prevents her from doing, cover the pot first to slightly cook the shortribs. "Until there is no more blood" is her instruction. If I were making this, I would also brown the meat slightly at this stage. Personally, I just like the beef to be slightly drier, with some crispy, caramelized bits, before adding all of the liquid ingredients. These are the "secret ingredients" I managed to wrangle out of our mother, as these weren't in the photographs. 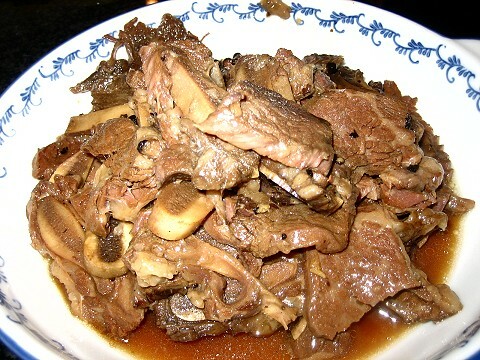 Add a little bit of shaoxing wine and optionally, as she said she also doesn't add this every time, a little bit of Worcestershire sauce. 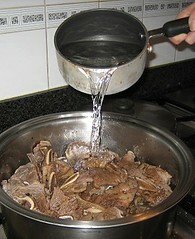 Cover the pot again and cook for about 10 to 15 minutes. Add the peppercorns. You can crush the peppercorns or you can leave them whole. 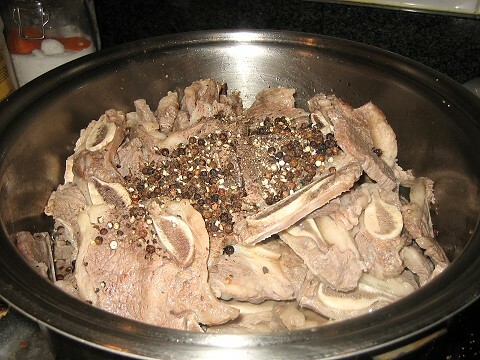 Here, they are crushed, but my mother has also done it with whole peppercorns only. If using whole peppercorns, one can, technically, enclose them in cheesecloth for easy removal later on. Our mother doesn't do this, of course. I think you know the reason by now. Or, perhaps she intended on improving our motor skills all these years by having us separate whole and semi-crushed peppercorns from wet, saucy grains of rice with our spoon and fork. The liquid ingredients are the usual suspects. 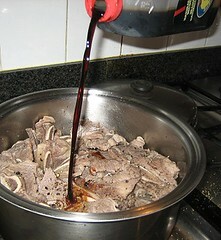 Yes, this is another soy-braised dish, so mix it some soy sauce and water, just to cover the meat. Mama's Black Peppercorn Shortribs with white rice (rice not pictured). Let the motor skill training begin. Delicious, too. this post is great! are you sure your mom isn't Italian? That's how all the people in my family try to explain recipes - a bit of this a bit of that... oh amy, i don't know how to tell you how to make it!! your mother seems so adorable. and this recipe really looks delicious and, as you say, simple. Step aside, I have Greek mom that's the "poster girl" for vague recipes! This dish sounds wonderful. I would tent these ribs in the oven but follow the remaining steps. Thanks to mom and to you (both?) for sharing. LOL I love how you mentioned that it's useful getting ingredients measurements from your mum. It's the same with mine, 'just a dash of this, and a bit of that...' Looks like a lovely braised dish. 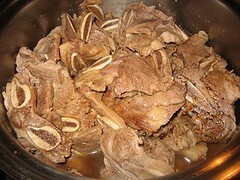 It could probably be cooked in a slowcooker/crockpot after browning the meat? Oh yum! This looks and sounds delicious! I love rice, too. So, this meal would be perfect for me. When asked how she makes a particular dish, *our* mother would often say something like, "It's all the same! They're all alike!" Great post and fantastic dish. I'll definitely be trying it out soon. My dad had a combination black peppercorn/ fermented black bean regime in operation for a large portion of my teenage life. The food was good -- we just ate it way too often. When I moved out, I nostalgically re-created some of his recipes, only to find myself horrified that I was falling into the peppercorn-black bean trap! I think I'm ok with these ingredients now, though (but only in moderation and not every week).